“Goji” (Lycium barbarum and Lycium chinense) is a generic name for medical plants with a long historical background in the traditional Chinese medicine. With the emerging trend of “Superfoods” several years ago, Goji berries soon became an established product in European countries and not only are the most popular product of traditional Chinese medicine outside of China but to this day one of the symbols of the entire “Superfood” trend. However, since Goji is an umbrella term for different plant species that are closely related, mislabeling and adulterations (unconsciously or purposely) are possible. We carefully verified the identity of Goji reference plant material based on morphological traits, mainly floral structures of several inflorescences of each individual, in order to create a robust background for the downstream applications that were used on those reference plants and additionally on commercial Goji products. We report morphological and molecular based strategies for the differentiation of Lycium barbarum and Lycium chinense. The two different Goji species vary significantly in seed size, with an almost double average seed area in Lycium chinense compared to Lycium barbarum. Differences could be traced on the molecular level as well; using the psbA-trnH barcoding marker, we detected a single nucleotide substitution that was used to develop an easy one-step differentiation tool based on ARMS (amplification refractory mutation system). Two diagnostic primers used in distinct multiplex PCRs yield a second diagnostic band in a subsequent gel electrophoresis for Lycium barbarum or Lycium chinense, respectively. Our ARMS approach is a strong but simple tool to trace either of the two different Goji species. Both the morphological and the molecular analysis showed that all of the tested commercial Goji products contained fruits of the species Lycium barbarum var. barbarum, leading to the assumption that consumer protection is satisfactory. A rising concern for health and an aging society seem to be important driving forces for the boom of “Superfoods” in Europe with a rapid sequence of new products entering a dynamic and further growing market. Germany ranks second (behind the United States) with respect to the import of products that are labeled as “Superfood” (Mintel, 2018). Every season new products are trending and advertised as “Superfoods.” Current trends are, for instance, basil seeds, or even varieties of cabbage, Brassica oleracea L., that have been in use in Germany for more than 500 years (Baumann et al., 2001) but currently experience a revival as “Superfood,” e.g., kale (Brassica oleracea var. acephala) Šamec et al., 2018. Some of these “Superfoods,” such as Chia seeds or Goji berries have in the meantime turned into established products that can be obtained in almost every supermarket or even in discounters as well. This hype of “Superfoods” is expected to continue, which can be seen in the sales numbers, that for Chia doubled from 2015 to 2016 to a volume around 23 million Euro in Germany alone (Statista, 2018a) and are still growing. Among the “Superfoods,” Wolfberries, or “Goji” rank among the leading products. “Goji” is the generic name for different plant species from the genus Lycium, belonging to the Solanaceae family. “Goji” represents the most popular product of traditional Chinese medicine outside of China (Chinadaily, 2018), the Western vernacular name “Goji” derives from the Chinese term gou qi (Potterat, 2010). In traditional Chinese medicine different plants, mainly Lycium barbarum L. and Lycium chinense Mill. are described under the umbrella term gou qi and have both been used for more than 2,000 years (Burke et al., 2005). Though exotic, Goji berries were already used in Europe before the introduction of the Novel Food Regulation (1997) to an extent that it did not fall under the Novel Food Legislation. However, this actually holds true only for the species Lycium barbarum. Several years ago, “Goji” berries were marketed as one of the first so called “Superfoods” and praised in advertisements and newspapers for miraculous properties (Latimes, 2018). Although it is already some time back that “Goji” berries became popular, they are still appreciated and bought for the perceived health effects, and continue to lead the charts for the most popular “Superfoods” (Statista, 2018b). Also in the news coverage of “Superfoods,” “Goji” is inevitably used as example and almost can be considered as symbol for the entire trend (SWR, 2018). While numerous reports refer to high levels of antioxidants, vitamins, minerals, or proteins that are claimed to account for the positive effects of such “Superfoods,” it has to be kept in mind that numerous traditional food plants harbor comparable levels of these healthy ingredients, rendering the term “Superfood” rather ambiguous. The combination of media hype with vernacular nomenclature (that had been separated from its traditional context) conceals the fact that it is often unclear, what plant is actually found in the package sold as “Goji.” Therefore, it is important to focus on the actual plants hidden behind the term “Superfood Goji.” The Flora of China distinguishes among others between Lycium barbarum ( , ning xia gou qi), Lycium chinense ( , gou qi), and Lycium ruthenicum Murray ( , hei guo gou qi, also called “Black Goji”) (Efloras, 2018). These plants are thorny shrubs (common name boxthorn) with heights up to three meters, small inconspicuous purple flowers and orange to red fruits (black for Lycium ruthenicum) that reach up to two centimeters in length. Especially Lycium barbarum and Lycium chinense are very similar with respect to morphology and phylogenetic relationship. Moreover, they grow in the same habitat, are harvested at the same time (usually from August to October) and have both been used in traditional medicine all over East Asia since thousands of years (Potterat, 2010). Because of their important role in traditional Chinese medicine, the fruits of “Goji” have been intensively investigated with respect to their bioactive compounds (reviewed in Potterat, 2010; Amagase and Farnsworth, 2011; Masci et al., 2018), as well as for their anatomical and histochemical features (Konarska, 2018). While both species are marketed to a conspicuous extent, the Pharmacopoeia of the People’s Republic of China lists only Lycium barbarum as the official drug (Zhonghua Renmin Gongheguo wei sheng bu yao dian wei yuan hui, 2000), and also the Novel Food Catalogue of the EU allows the usage of only Lycium barbarum as food or food ingredient (Europa, 2018). Because of these legal constraints, providers of Goji Berries claim that their commercial products that are offered outside of Asia exclusively contain fruits of Lycium barbarum (Potterat, 2010). However, not all commercial Goji products are properly labeled with the scientific name. Usually the generic name “Goji” is accompanied by additional Western vernacular names, such as Boxthorn, Wolfberry, Chinese Wolfberry, or Matrimony Wine which does not really contribute to consumer safety (Blaschek et al., 1993). Considering how closely related these species are, this nomenclatural nonchalance and partially also ignorance will easily create mislabeling. A simple and robust one-step differentiation method based on molecular markers derived from carefully determined reference plants is needed. Such a marker has to be robust enough to be amenable to processed samples, since “Goji” is often sold as powder, and even for dry fruits it is very hard to trace back to the originating plant(s). A set of 15 accessions of Lycium was analyzed in this study (Table 1). The set included two specimens of Lycium barbarum, one of Asian origin and one commercially available in Germany, and seven specimens of Lycium chinense that were all cultivated and are maintained in the Botanic Garden of the Karlsruhe Institute of Technology. Fruits from Lycium ruthenicum were obtained from China. To get insight into the phylogenetic relations of Lycium barbarum and Lycium chinense, four additional Lycium species were cultivated, including specimens of the Mediterranean (Lycium europaeum L.) and South American (Lycium chilense Bertero and Lycium ameghinoi Speg.) regions. In addition, the DNA of one South African specimen (Lycium oxycarpum Dunal) was included into the study. This set of 15 Lycium specimens was complemented by a set of 17 “Goji” commercial products that were obtained as dried fruits from different sources (Table 2), making in total 32 accessions. Table 1. Lycium reference specimens, overview of identity and origin. Table 2. Commercial Goji products obtained from different sources. The identity of specimens was verified by taxonomical identification using appropriate taxonomic keys (Flora of China (Efloras, 2018), Schmeil/Fitschen: The Flora of Germany and the neighboring countries, 95th edition (Schmeil and Fitschen, 2011). In detail, we documented floral traits (i.e., pubescense of corolla, undulation of calyx, length of corolla tube) from 30 inflorescenses of each of the L. barbarum and L. chinense accessions to eliminate errors in determination that might occur when looking only at a single flower. The observed characteristics were documented digitally (Stereolupe 420, Leica, Bensheim, Germany). Fruits of the cultivated plants were harvested and the seeds phenotyped quantitatively. 30 seeds of each Lycium barbarum, Lycium chinense and Lycium ruthenicum accession, as well as from all of the commercial “Goji” products were excised from at least five different fruits and digital images recorded (Stereolupe 420, Leica, Bensheim, Germany). The digital images of the seeds were analyzed using the program SmartGrain (Tanabata et al., 2012). With this software many parameters like area size or length-to-width ratio of seeds can be measured, after the digital image of the seeds is loaded into the program, and the scale bar is calibrated by the “set scale” tool. SmartGrain automatically detects the objects of the image, or the seeds can be picked manually as well. To evaluate and illustrate the obtained data as boxplots R Studio version 3.2.0 was used. DNA from fresh leaves of reference plants (using 60 mg of starting material) and dried fruits of commercial products (using 120 mg of starting material) was isolated using the Invisorb® Spin Plant Mini Kit (Stratec Biomedical AG). The quality and quantity of isolated DNA was evaluated by spectrophotometry (NanoDrop, Peqlab), and DNA concentration was diluted to 50 ng/μl to be used as template in PCR. A 30 μl reaction volume containing 20.4 μl nuclease free water (Lonza, Biozym), onefold Thermopol Buffer (New England Biolabs), 1 mg/ml bovine serum albumin, 200 μM dNTPs (New England Biolabs), 0.2 μM of forward and reverse primer (see Primer list, Table 3), 100–150 ng DNA template and three units of Taq polymerase (New England Biolabs) was used to amplify the marker sequences. 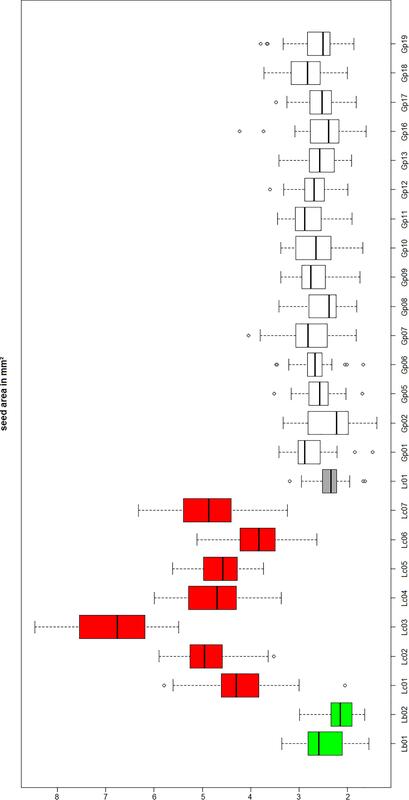 Thermal cycler conditions for the amplification of the psbA-trnH intergenic spacer region included initial denaturation at 95°C for 2 min; following 33 cycles at 94°C for 1 min, 56°C for 30 s, 68°C for 45 s; ending with an extension of 68°C for 5 min. The PCR was subsequently evaluated by agarose gel electrophoresis using NEEO ultra-quality agarose (Carl Roth, Karlsruhe, Germany). DNA was visualized using SYBRsafe (Invitrogen, Thermo Fisher Scientific, Germany) and blue light excitation. The fragment size was determined using a 100 bp size standard (New England Biolabs). Amplified DNA was purified for sub’sequent sequencing using the MSB® Spin PCRapace kit (Stratec). Sequencing was outsourced to Macrogen Europe (Netherlands) or GATC (Germany). The quality of the obtained sequences was examined with the program FinchTV Version 1.4.01. To get a more robust result, the marker region was sequenced from two directions. The resulting two sequences were merged for each accession. For the sequence alignment and the phylogenetic analysis the program MEGA7 (Version 7.0.14) with the integrated tree explorer was used (Kumar et al., 2016). The Sequences were aligned using the Muscle algorithm of MEGA7 (Edgar, 2004). Alignments were trimmed to the first nucleotide downstream of the forward primer and the nucleotide preceding the reverse primer. With the same software, the evolutionary relationships were inferred by using the neighbor-joining algorithm with a bootstrap value that was based on 1,000 replicates (Felsenstein, 1985; Saitou and Nei, 1987). The species Nolana werdermannii was chosen as an outgroup, since the genus Nolana is a sister taxon to the Lycieae (Levin and Miller, 2005). The psbA-trnH spacer region sequence for N. werdermannii (GenBank: FJ189604) was obtained from the NCBI database. A single nucleotide difference in psbA-trnH intergenic spacer sequences of L. barbarum and L. chinense was used to design a diagnostic primer to clearly discriminate these two closely related species in an one-step duplex-PCR protocol. The primer was designed with the Primer3Plus webtool (Untergasser et al., 2012). A thymine in position 265 of the psbA-trnH multiple sequence alignment in Lycium barbarum is substituted by a guanine in the other Lycium species. Thymine was placed at the 3′-end of the diagnostic primer and an additional nucleotide was exchanged in the 3′-region, to prevent the binding of the primer to the other Lycium species. With this design, this diagnostic primer (LB_265T_fw) should only be able to bind to the Lycium barbarum accessions. Since the region surrounding this nucleotide substitution is very AT-rich, the primer length had to be increased to 31 nucleotides in order to reach an appropriate annealing temperature. Based on the same strategy, a second diagnostic primer (LC_265T_fw) was designed that should only bind to the psbA-trnH spacer region template of Lycium chinense. 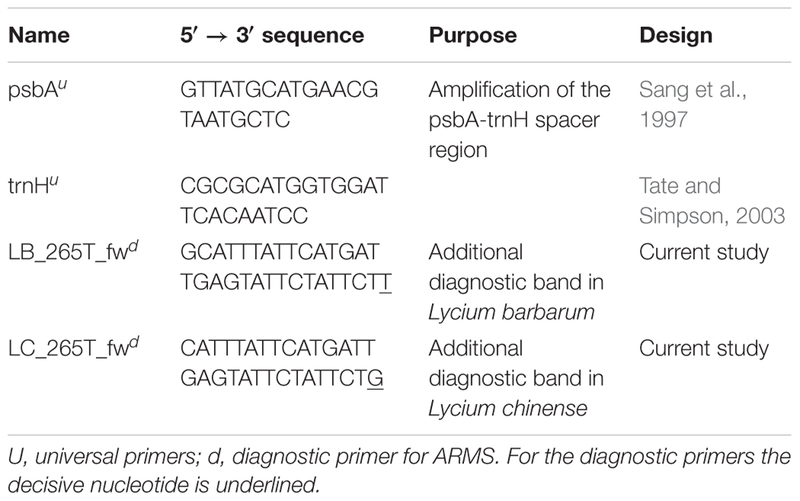 These diagnostic primers were then used in combination with the universal psbA and trnH primers (see primer list, Table 3) in distinct duplex-PCRs. Usage of either LB_265T_fw or LC_265T_fw ought to yield an additional second diagnostic band of 290 bp in only one of the species while in the other species only the full-length amplicon with a length of 546 base pairs would be visible after the gel electrophoresis. We tested this prediction and validated the predicted readout experimentally (Figure 6). To assess the validity of morphological traits that are used to delineate the main species behind “Goji,” we assessed three morphological features that are used to discriminate Lycium barbarum and Lycium chinense (Reference Flora of China) across 30 inflorescences collected from the reference plants (Figures 1, 2). An elongated corolla tube and glabrescence of corolla blades as distinctive traits of Lycium barbarum (Figure 1A) were consistently found over all investigated 30 inflorescenses collected from each of the two reference plants. In contrast, for all reference plants of Lycium chinense all corolla blades were densely pubescent at the margin (Figure 2A), and the corolla tube was distinctively shorter than the corolla lobes (Figure 1A). Thus, both of these traits could be validated to differentiate Lycium barbarum and Lycium chinense specimens. 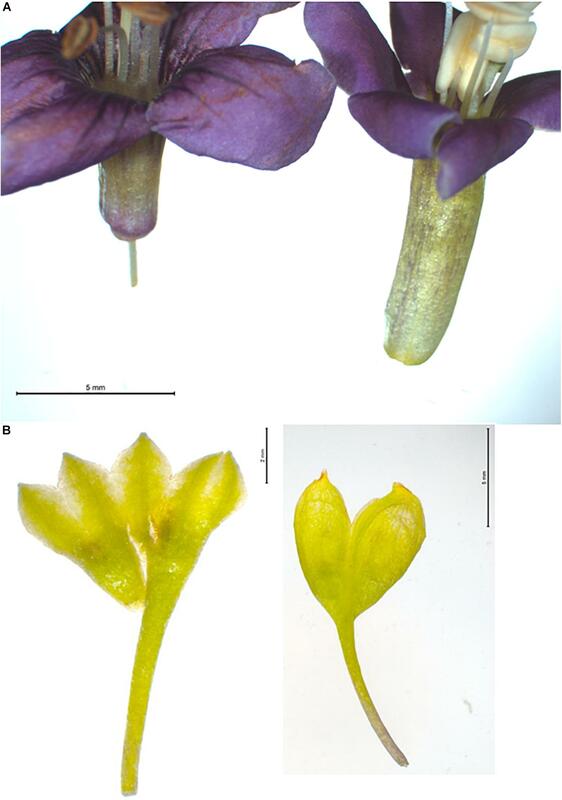 Opposed to this, the third feature reported to discriminate the two species, the number of calyx lobes (Figure 1B), was not consistent over all flowers of Lycium chinense. Depending on the accession, between 6.7% (in accessions 5551 and 6815) and 23.3% (in accession 5550) of the Lycium chinense flowers had a two-lobed calyx, which is usually characteristic for Lycium barbarum. In fact, without any exception, all flowers of our Lycium barbarum accessions had a calyx that was two-lobed. The Flora of China additionally lists different varieties of Lycium barbarum and Lycium chinense, respectively. However, all of the available reference plants were determined as either Lycium barbarum var. barbarum or Lycium chinense var. chinense. Figure 1. Two morphological traits to differentiate Lycium barbarum and Lycium chinense based on floral traits. (A) Corolla of Lycium chinense (left) and Lycium barbarum (right). The flora of china mentioned difference in corolla tube length is clearly visible; for Lycium barbarum the corolla tube is obviously longer than the corolla lobes. (B) Opened and flattened calyx of Lycium chinense (left) and Lycium barbarum (right). Lycium chinense is usually three to five lobed, whereas Lycium barbarum has only two lobes. Compared to the corolla tube length this trait is not 100% consistent. Figure 2. (A) Comparison of corolla lobe pubescence in Lycium chinense (left) and Lycium barbarum (right). The corolla lobes of the latter are glabrescent, while Lycium chinense corolla lobes are finely haired. (B) Difference in seed size can be seen with the bare eye in some cases, with significant smaller seeds of Lycium barbarum. See Figure 3. Since “Goji” is traded as fruit, we were searching for morphological traits that can be inspected in fruits and allow to discriminate the two types of “Goji” berries. We noted that the seeds of Lycium barbarum var. barbarum and Lycium chinense var. chinense differ significantly in size (Figure 2B), and we quantified this trait by measuring cross-section areas (Figure 3). The two available accessions of Lycium barbarum var. barbarum showed cross sections that were less than half of those seen in the seven investigated Lycium chinense var. chinense (<2.5 mm2 as compared to almost 5 mm2). Although the intraspecific variation in Lycium chinense var. chinense was more pronounced, even the accessions with smaller seeds were clearly bigger than seeds from Lycium barbarum var. barbarum plants. The single available accession of Lycium ruthenicum had small seeds that are comparable to the values of the two Lycium barbarum var. barbarum sizes, but it is easy to delineate those fruits, due to their black pericarp. With an average boxplot median of 2.62 mm2 all the investigated commercial Goji products had seed sizes that were comparable to Lycium barbarum var. barbarum, with low variance between the different commercial samples; the lowest median was Goji product 2 (2.22 mm2), and the highest median was Goji product 19 (2.88 mm2), suggesting that these “Goji” products indeed contained Lycium barbarum. Figure 3. Lb, Lycium barbarum var. barbarum; Lc, Lycium chinense var. chinense; Lr, Lycium ruthenicum; Gp, commercial Goji product. Seed size evaluation of the reference plants Lycium barbarum var. barbarum (green), Lycium chinense var. chinense (red) and Lycium ruthenicum (dark gray). Those values are compared to the commercial Goji products (white). The median of the Lycium barbarum var. barbarum reference plants is between 2 and 3 mm2, whereas the Lycium chinense var. chinense seeds are significantly bigger in area size with a median between 4 and 6 mm2. Lycium ruthenicum seeds are smaller again, with a median slightly bigger than 2 mm2. The commercial Goji products have boxplots medians ranging from 2 and 3 mm2, similar to Lycium barbarum and Lycium ruthenicum. To probe the phylogenetic relationship of the three different “Goji” species (Lycium barbarum var. barbarum, Lycium chinense var. chinense and Lycium ruthenicum) and the tested commercial products (abbreviated as Gp in Figure 4) in comparison to Lycium accessions from Europe and the New World, we used a 510-bp region of the psbA-trnH marker including the variable intergenic spacer (Figure 4). Although this universal psbA-trnH spacer region is one of the most variable DNA barcodes, we found only small differences between those three obviously closely related species. The only difference between Lycium barbarum var. barbarum and Lycium chinense var. chinense was one nucleotide substitution at site 265 with a thymine for Lycium barbarum var. barbarum and a guanine for Lycium chinense var. chinense and Lycium ruthenicum (Figure 5A). As already seen for seed size (Figure 3), the commercial “Goji” products all clustered with Lycium barbarum by sharing the informative thymine at position 265. The three Asian species are closely related to each other and clearly clustered separately from the two tested species from South America, as well as from the two species from Europe and South Africa (Figure 4). Lycium ruthenicum had an additional substitution from thymine to guanine at site 358 and an additional nine nucleotide insert at site 450, that was neither present in Lycium barbarum, nor in Lycium chinense. All accessions of L. barbarum var. barbarum and L. chinense var. chinense were identical within the respective species. The variations were exclusively interspecific. This single nucleotide substitution was used to design a strategy based on ARMS to discriminate Lycium barbarum from Lycium chinense. Figure 4. Phylogenetic tree based on psbA-trnH spacer region sequences of morphological identified Lycium reference plants and commercial Goji products. The evolutionary history was inferred using the Neighbor-Joining method (Saitou and Nei, 1987). The percentage of replicate trees in which the associated taxa clustered together in the bootstrap test (1,000 replicates) are shown next to the branches (Felsenstein, 1985). There were a total of 532 positions in the final dataset. Nolana werdermannii was chosen as outgroup. The reference plants of Lycium barbarum var. barbarum (green), Lycium chinense var. chinense (red) and Lycium ruthenicum (black) are labeled with colored squares. The evaluated commercial Goji products are labeled with light gray squares. To put the three different “Goji” species into a context of the Lycium genus, species from South America (Lycium chilense and Lycium ameghinoi, yellow) and Europe (Lycium europaeum and Lycium oxycarpum, blue) were included into the phylogenetic analysis. The Lycium barbarum var. barbarum reference plants cluster with the Goji products, while Lycium chinense var. chinense (that is closest related to Lycium barbarum) and Lycium ruthenicum have their own clusters. Figure 5. (A) Partial depiction of the multiple sequence alignment of different reference plants. The decisive nucleotide that is used for designing the diagnostic primers is located at site 265 in the alignment of the psbA-trnH spacer regions of the respective samples. Lycium barbarum var. barbarum and the commercial Goji products have a thymine at this site, whereas Lycium chinense var. chinense and Lycium ruthenicum have a guanine. (B) Predicted banding pattern of the psbA-trnH spacer region fragment and the diagnostic fragments after the ARMS-based multiplex PCR. Left: using the diagnostic primer for tracing Lycium barbarum var. barbarum. Right: using the diagnostic primer for tracing Lycium chinense var. chinense and Lycium ruthenicum. To develop an assay that allows an easy one-step discrimination of the two main “Goji” species in unprocessed commercial samples, we used the single nucleotide polymorphism at position 265 of the psbA-trnH spacer (Figure 5A) to apply an ARMS based-strategy. 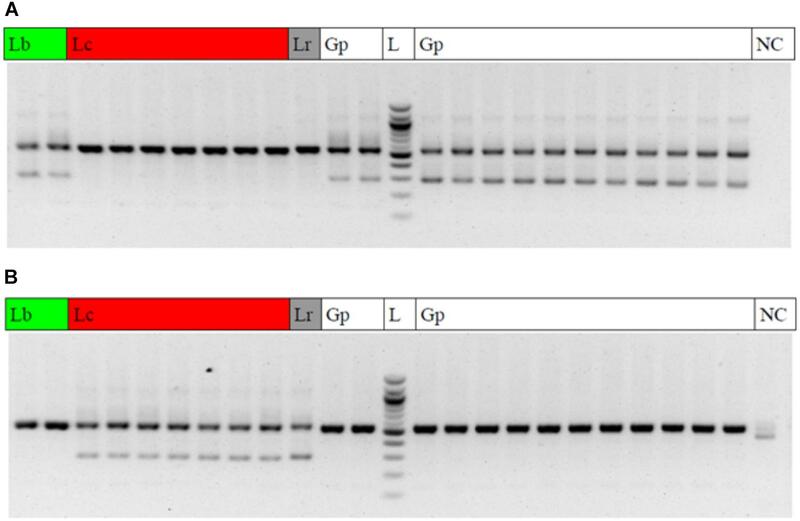 Two diagnostic primers – LB_265T_fw and LC_265T_fw – with complementary readouts were designed (Figure 5B). The diagnostic LB_265T_fw primer yielded clear diagnostic bands with a fragment length of 290 base pairs at the two Lycium barbarum var. 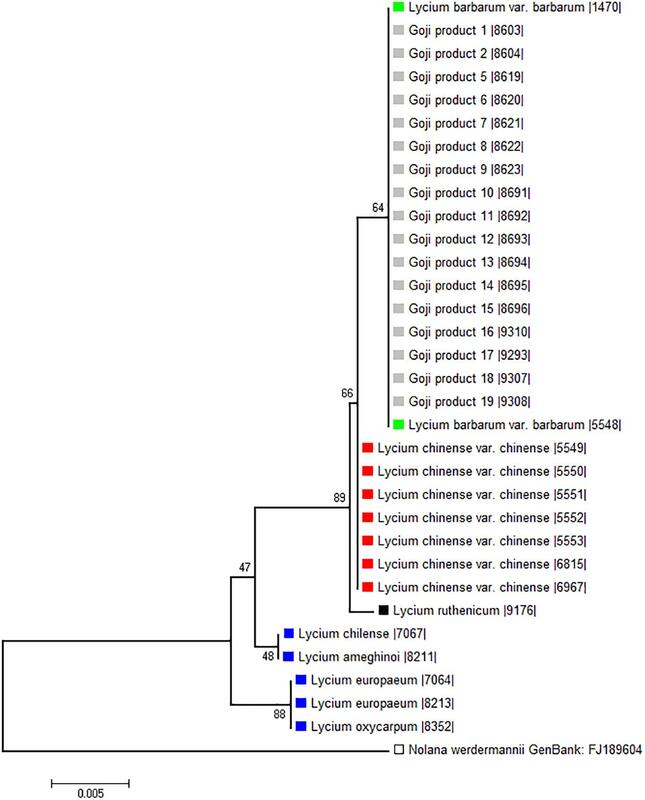 barbarum accessions and all of the Goji products (Figure 6A), while this diagnostic band was absent in Lycium chinense var. chinense and Lycium ruthenicum. Conversely, adding the LC_265T_fw diagnostic primer in a duplex-PCR, the diagnostic 290-band was present in all the Lycium chinense var. chinense accessions and the Lycium ruthenicum sample, but absent in the Lycium barbarum var. barbarum reference plants and the commercial Goji products (Figure 6B). Figure 6. Gel electrophoresis result of the multiplex ARMS PCRs. Lb, Lycium barbarum var. barbarum; Lc, Lycium chinense var. chinense; Lr, Lycium ruthenicum; Gp, commercial Goji product; L, 100 bp ladder; NC, negative control. 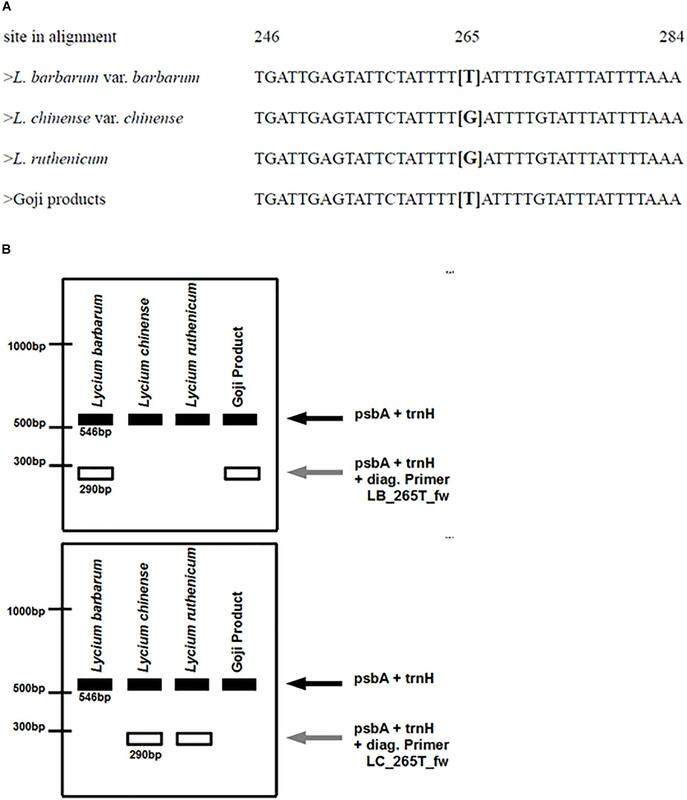 (A) PCR with the universal psbA and trnH primers and the additional LB_265T_fw diagnostic primer to trace Lycium barbarum var. barbarum. A clear double band occurs with the Lycium barbarum var. barbarum reference plants (lines 1 and 2) and all of the tested Goji products (Lines 11, 12, and 14–24). The second (diagnostic) band is absent in Lycium chinense var. chinense reference plants (lines 3–9) and Lycium ruthenicum (line 10). Line 13 is a 100 bp ladder. The last lane is the negative control. (B) PCR with the universal psbA and trnH primers and the additional LC_265T_fw diagnostic primer to trace Lycium chinense var. chinense. When using this additional primer a second band is visible for all the Lycium chinense var. chinense reference plants (lines 3–9) and Lycium ruthenicum (line 10). This band is absent in Lycium barbarum var. barbarum and the commercial Goji products. In the current work, we have developed an one-step assay to discriminate two closely related, but distinct species of Lycium that are used in traditional Chinese medicine and are currently booming in Europe and US as so called “Superfood” under the common vernacular name of “Goji berries.” Based on validated plant material, we have developed morphological and molecular traits that allow to differentiate between both species, and we have developed a robust one-step PCR-based assay that can reliably identify any given unprocessed commercial product as either Lycium barbarum or Lycium chinense. It is a time where the possibilities of plant molecular biology appear to be overwhelming, including huge throughput of whole-genome sequencing, mapping of gene regulatory networks and phylogenomics; however, a rather ancient nevertheless essential discipline of botany starts to have its renaissance (Ledford, 2018). Although it is often considered as trivial task, to actually look at and morphologically determine the plant that is the subject of the study, this task is far from trivial. Surveys of misdeterminations and mislabeling in herbaria, botanical gardens, and germplasm collections show that between 10 and 20% of accessions are not what they are supposed to be (Goodwin et al., 2015). Even for DNA barcoding, the correct determination of the used reference plant material is a necessary precondition for the validity of the outcome. This requirement is even more important for medicinal plants or plants that are en vogue because of their promised health effects. The power of the determination key is crucial to have a robust background for all subsequent experiments. Unfortunately in many keys terms with a low degree of certainty like “about” or “usually” are used, that can be interpreted differently by different taxonomists. This is also true for the otherwise high-quality Flora of China, that was mainly used in this study. For the discrimination of Lycium barbarum and Lycium chinense terms such as “usually 2-lobed” can be found in this key. To avoid uncertainties in determining a plant species, different morphological traits should be applied, if possible. The Flora of China lists three different traits to distinguish between the two gou qi species, Lycium barbarum and Lycium chinense. Regarding the close relation of those two species, the common usage of both species in traditional Chinese medicine and the expectation of consumers to get the correct plants in the purchased products, the importance of correct determination is undoubtedly urgent. For the discrimination of closely related plant species, the evaluation of floral morphology traits should be central, since they are most likely linked with the reproductive isolation between these species. With the combination of the different floral traits, corolla pubescence, length of corolla tube and the number of calyx lobes, an impeccable discrimination of the two widely used Goji species could be done for the available reference plants. However, the corolla traits were more robust and therefore more reliable compared to those of the calyx, since there was variability in the features of the calyx in a considerable number of investigated inflorescences of Lycium chinense. The importance of evaluating an appropriate number of flowers becomes obvious, because phenomena like phenotypic plasticity or changes due to environmental factors can influence the appearance of single plant organs. For instance, differences in the velocity of polar auxin transport as they might occur depending on light quantity and quality are expected to modulate the number of apices in the primordial whorl committed to form the calyx (Reinhardt et al., 2003). However, the possibility that the morphospecies Lycium chinense might comprise several genetically isolated cryptospecies, should also be kept in mind. 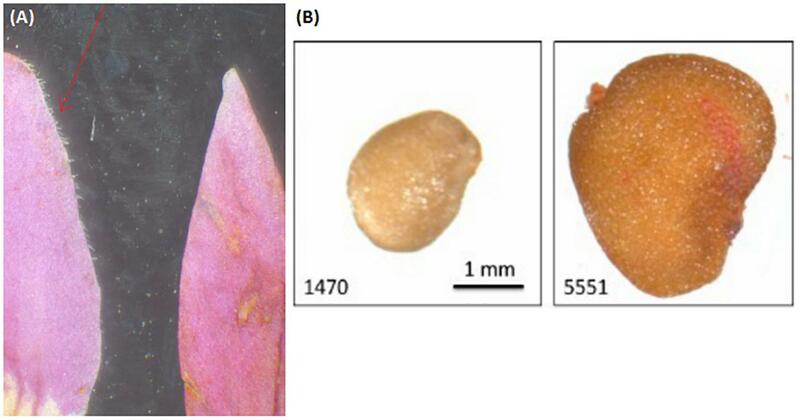 The seed analysis revealed significant differences in the area size of Lycium barbarum var. barbarum and Lycium chinense var. chinense specimens. Thus, besides the prior described differences in the reproductive organs the two species can be distinguished by the size of their dispersal units. All the seeds of the tested commercial Goji products had similar boxplots medians compared to the two Lycium barbarum var. barbarum reference plants, wherefore we conclude that all the investigated commercial Goji products are actually fruits of the ningxia gou qi (Lycium barbarum). The boxplot median of the commercial products is comparable to Lycium ruthenicum as well; however, since the fruits of Lycium barbarum and Lycium chinense differ in size and especially in color from Lycium ruthenicum, surrogation by this species is unlikely. The evaluated commercial Goji products of this study were obtained from a many different companies and different geographic origin. Nevertheless, all of the investigated products seem to originate from Lycium barbarum var. barbarum plants. Asian companies claim to sell only the ningxia gou qi (Lycium barbarum) as “Goji” in commercial products outside of China. Our results suggest that the consumer protection seems to be quite satisfactory in this respect, and that the “correct” products are sold on the German market. However, the pronounced difference in price for otherwise comparable “Goji” products indicates that consumer protection has to consider additional aspects of quality assessment. In this context, it should be noted that in China, “Goji” is marketed in different quality grades termed “super,” “king,” “special,” and “Grade A,” (EzineArticles, 2018) whereby the grade is linked with berry size. In other words, berries of Lycium chinense would be sold at higher prize. Thus, the fact that only the small Lycium barbarum berries were found in the commercial products sampled in Germany might therefore have a different explanation from a efficient system of consumer protection: the smaller berries from Lycium barbarum are less attractive for consumers in China (except for the few knowledgeable professionals that know about their medicinal value) and therefore are preferentially exported to Europe and the United States, where they still can be sold at high price. While the commercial Goji products as well as the Lycium barbarum var. barbarum reference plants show a fairly homogenous seed size, there is significant intraspecific variation in seed size among the accessions of Lycium chinense var. chinense. Since the measured seeds were chosen randomly and the sample size was sufficient, the likelihood that this variation is caused by sampling bias is rather low, which means that the differences in size must have genetic or developmental reasons. There are some reports that the chromosome number of Lycium chinense varies from 2n = 24 to 36 or even 48 (Tropicos, 2018), which would mean that there exist cryptospecies within Lycium chinense. This might also be a possible factor for the observed variability seen in calyx lobing between the different accessions of this species. The enlargement of seed size in Lycium chinense might therefore be linked with allopolyploidy. However, for the closely related Asian Goji species the literature regarding karyotypes is surprisingly scarce. During the past years, the phylogenetic relations within the genus Lycium and its biogeographic background has been intensively studied. One of the surprising outcomes was the paraphyletic nature of Lycium (Fukuda, 2001; Levin and Miller, 2005). Different barcoding marker regions were used and combined for the genus to which Goji belongs, ranging from the more common rbcL, matK, trnF–trnH, psbA-trnH to conserved ortholog sequences (COS) regions (Levin and Miller, 2009). For our morphologically validated species we choose the sequences of the highly variable chloroplast psbA-trnH spacer region to find small differences in sequences that can be utilized for a simple one-step test to discriminate Lycium barbarum and Lycium chinense. However, we wanted to link our data into the context of the Lycium genus as well. We found three well separated clades corresponding to the three biogeographic regions. The East Asian “Goji” species were closely related, and formed a separate clade distinct from the other Old-World and the clade from New-World species of Lycium. Of course, for a biogeographic and in-depth phylogenetics approach many independent regions should be evaluated for a large set of species to receive a robust tree. However, as mentioned above this has been done extensively and our main goal was to find informative single-nucleotide polymorphisms that can be used to differentiate between the two “Goji” species Lycium barbarum and Lycium chinense by a one-step ARMS assay. The reliance on DNA based-methods is crucial, since the flowers of a commercial Goji product can obviously not be traced back, and some commercial Goji products are processed as powders as well. Based on the single nucleotide substitution between Lycium barbarum and Lycium chinense two diagnostic ARMS primers could be designed to trace either of the species. In both of the Lycium barbarum var. barbarum reference plants using the LB_265T_fw primer, and in all of the seven Lycium chinense var. chinense reference primer using the LC_265T_fw primer, the desired second diagnostic band could be amplified in distinct multiplex PCR approaches. The results of this molecular approach strengthen the data of the seed analysis, because for all commercial Goji products there was an additional diagnostic band, when using the LB_265T_fw primer. Thus, all of the investigated commercial Goji products were authenticated morphologically and by molecular markers to be Lycium barbarum var. barbarum. The advantage of this ARMS approach is the implemented positive control of the universal psbA-trnH spacer region band in the gel. This control displays that the extracted DNA is actually of good quality and, more importantly, that the region of interest is present and the discrimination occurs exclusively because of the nucleotide substitution between the two species. Apart from the practical application of the discrimination for two closely related species of commercial importance, we’d like to highlight the importance of morphology and taxonomy and the endangered art of looking at plants in order to really understand them. While considerable effort has been invested into the evaluation of bioactive compounds of Goji (Chang and So, 2008), to our knowledge this is the first case, where a robust one-step discrimination for these closely (from an evolutionary, cultural-historic and medicinal point of view) related “Goji” species has been developed. Previous studies have used RAPD fingerprinting and the downstream Sequence characterized amplified region (SCAR) strategy (Zhang et al., 2001; Sze et al., 2008). A disadvantage of RAPD in authentication is its limited reproducibility and reliability as fingerprint patterns are strongly dependent on sample quality and DNA integrity. Despite these drawbacks RAPD is a rapid and cost effective method that continues to be used today (Krishnan et al., 2017), especially for authentication approaches combined with downstream SCAR markers (Mei et al., 2017). RAPD-based SCAR markers yield reproducible binary results, and this method has been used successfully for “Goji” (Sze et al., 2008), ginseng (Panax ginseng C.A. Mey.) (Wang et al., 2001), saffron (Crocus sativus L.) (Torelli et al., 2014), and others. The validation by SCAR at first sight seems easier to interpret, because only a single band has to be assessed. However, missing bands after gel electrophoresis could also be caused by problems with DNA purity or integrity, or likewise with suboptimal conditions of the PCR. Both problems are avoided by the ARMS approach, because the full-length amplicon serves as an inbuilt positive control to calibrate presence or absence of the additional diagnostic band. ARMS has been successfully used for authentication of several TCM taxa, including Curcuma (Sasaki et al., 2002), Alisma (Li et al., 2007) and Rheum (Yang et al., 2004). The authors emphasize the efficiency and reproducibility of this method. We realize that the ARMS application has its disadvantages as well, i.e., if it is applied to “Goji” products that are processed as powders, one would need to extend the one-step protocol and use both diagnostic primers to examine whether only Lycium barbarum, only Lycium chinense or both species are present in the respective sample. For strongly degraded DNA that might derive from extraction of processed powder products the amplification of the relatively long psbA-trnH spacer region might be difficult, meaning the internal control that is the advantage of this ARMS approach might suffer in quality. However, most of the commercial “Goji” products are sold as unprocessed dried fruits, for which the presented method easily can be applied. The ARMS approach shown in this study is not limited to superfoods like “Goji,” but equally applicable to other fields of nutrition, and has the potential to be an important tool for consumer safety and quality control when it comes to discriminating “real” ingredients from surrogate species. The public availability of sequences for a large number of different plant taxa in NCBI GenBank makes it easy to design ARMS primers for prospective projects, and in many cases removes the need for initial sequencing to design new ARMS primers. However, we want to emphasize that only sequences from correctly identified herbarium vouchered material should be used for the highly sensitive ARMS method. PN and TH contributed to the idea, topic, background information, and experiment planning. SW carried out the shown experiments under the lab supervision of TH. PN and SW wrote the manuscript. We acknowledge support by Deutsche Forschungsgemeinschaft and Open Access Publishing Fund of Karlsruhe Institute of Technology. We also acknowledge the staff of the Botanical Garden of the KIT for their excellent support. Baumann, B., Baumann, H., and Baumann-Schleihauf, S. (2001). Die Kräuterbuch Handschrift des Leonhart Fuchs, 1st Edn. Stuttgart: Ulmer Verlag. Blaschek, W., Hänsel, R., Keller, K., Reichling, J., Rimpler, H., and Schneider, G. (1993). Hagers Handbuch der pharmazeutischen Praxis: Drogen E–O, Vol. 5. Berlin: Springer Verlag. Burke, D. S., Smidt, C. R., and Vuong, L. T. (2005). Momordica cochichinensis, Rosa roxburghii, wolfberry, and sea buckthorn – highly nutritional fruits supported by tradition and science. Curr. Top. Nutraceutical. Res. 3, 259–266. Old, J. M. (1992). Detection of mutations by the amplification refractory mutation system (ARMS). Methods Mol. Biol. 9, 77–84. Šamec, D., Urliæ, B., and Salopek-Sondi, B. (2018). Kale (Brassica oleracea var. acephala) as a superfood: review of the scientific evidence behind the statement. Crit. Rev. Food Sci. Nutr. doi: 10.1080/10408398.2018.1454400 [Epub ahead of print]. Schmeil, O., and Fitschen, J. (2011). Flora Von Deutschland und Angrenzender Länder, 95th Edn. Wiebelsheim: Quelle & Meyer Verlag. Tate, J. A., and Simpson, B. B. (2003). Paraphyly of tarasa (Malvaceae) and diverse origins of the polyploid species. Syst. Bot. 28, 723–737. Zhonghua Renmin Gongheguo wei sheng bu yao dian wei yuan hui (2000). Pharmacopoeia of The People’s Republic of China. Beijing: Chemical Industry Press. Copyright © 2018 Wetters, Horn and Nick. This is an open-access article distributed under the terms of the Creative Commons Attribution License (CC BY). The use, distribution or reproduction in other forums is permitted, provided the original author(s) and the copyright owner(s) are credited and that the original publication in this journal is cited, in accordance with accepted academic practice. No use, distribution or reproduction is permitted which does not comply with these terms.